I mentioned a while ago that I was making the wedding for my friends’ wedding (along with my partner in crime Kat). Unbelievably, the wedding has been and gone (in a flurry of fabulous dresses and fun times) and I’m no longer a wedding cake virgin. So, what did I learn? 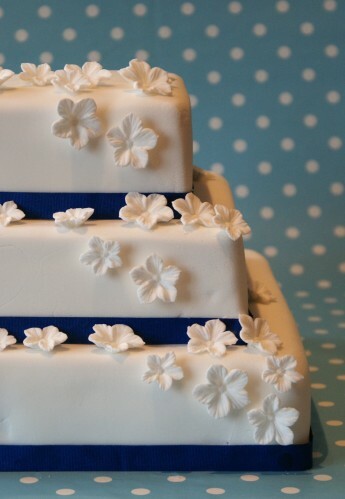 Well… wedding cakes are strange beasts, quite unlike normal cakes. I like baking, I like to think I’m pretty good at baking but wedding cakes require a patience and attention to detail that I struggle with. But, I am getting better (see below) and I’ve shared my tips and advice in this blog post of BBC Food. I think the most daunting thing about making a wedding cake is knowing where to start and understanding all the new terminology (what’s the difference between a cake scraper and a cake smoother? What are dowelling rods used for?) so I’ve tried to break it all down into a step-by-step guide. It’s worth pointing out that this picture is from a trial run-through that we did for the cake. Yep, we made a whole trial wedding cake. Having never made anything like this before, it was so useful (and my work colleagues happily scoffed the cake). I’m so glad I didn’t have to assemble a three-tiered wedding cake for the first time on the day of the wedding or have to try and roll fondant icing into a big enough circle to cover a 12in cake. Now for the details: the bottom tier was a 12in version of this chocolate cake, the middle was this vanilla cake (which was a big hit) and we did a fruit cake for the top tier (which the bride and groom have in the freezer for their first child’s christening). 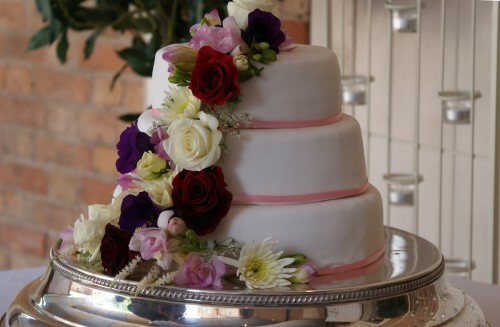 If you’d like to make this wedding cake, I can send you the recipe we used. This is the second wedding cake I made for my lovely friend Nicky and her husband(!) Juan. Nicky cooks almost as much as me (when she’s not reviewing restaurants for Square Meal) and we worked together to find the right cake. In the end, it was this orange and almond cake, iced with buttercream then fondant. The slight bitterness of the cake is perfect with the sugar overload from the icing. What did I learn this time? Let the experts help you. We delivered the iced cakes to the venue the day before the wedding and they assembled the cake and the florist decorated it. Looks pretty good huh? I would never have been able to do this myself and would probably have had a nervous breakdown in the process. This is absolutely awesome! Making a cake for one of your friends…what a tremendous gift! I think I would die of nerves and face-plant into the cake before it was done if I had that responsibility though – bravo! I first became aware of your wonderous baking/cooking via the bbc food website, when I baked you easy Chocolate cake for my nephew’s birthday. I is impossible for me to convey how much of a ‘HIT’ it was; such a gorgous, moist, tasty & easy to make cake; to the extent now my family & friends are ‘thinking up celebrations’ that they have the opportunity to request I make the cake again. Thanks for this gift, bravo to you. With this in mind please could you email me recipe with measurements you used to convert the chocolate cake to 12″, along with easy vanilla cake (Jane Horbys) food measurements conversations, as I hope to emulate the above cakes for a upcoming special occasion. Thanks for your lovely comment! That chocolate is so good isn’t it! I’ll send you the recipes now. my sincerest thanks… I have received the recipes, along with your cooking tips, advice & recommendations; truly kind & generous for you to take the time to do this!